Hi, interesting request! But it also means that the camera needs to stay in working mode for longer period everytime it is triggered, accelerating its power assumption. Some users may misuse this part and complain about the batteries life, which is a headache. Hi Bob, totally agree to your point. So I think it will be a great idea if user can choose how many shots they want to capture? For users with heavy traffic, they might want to keep it at one shot only due to power assumption. It will also be nice if there is a feature to push the captured images/videos to FTP server, because if the thief decide to break/steal the camera, then I will still have the footage on a remote storage location of who stoled me camera :). Please provide the ability to disable motion detection from the app without having to clear the motion settings. When it rains it would be nice to disable the notifications without have to clear and recreate them. Yes, I would like to see some feature implemented to allow temporarily disable motion detection for raining condition. Would really like to get some ideas from you guys here. Just enabling motion detection to be disabled would be sufficient as a first step. Ok, that sounds reasonable and easily implemented, I would say. Or can I just add, also allow options to set the disabling for a period of time, say, 1 hours, 2 hours, or until I manually turn it back on. I would provide both. The ability to turn off motion detection until it is re-enabled and the ability to set a timer to re-enable. If I had to prioritize I would provide the disable option first and let the user be responsible for re-enabling it. I suppose this “pre-record” and “post-record” only available in the NVR? Thank you guys for your brilliant ideas. I will put in your requests. For RLC-410S, it has pre-record when recording to its on-board microSD card. The option for pre-record is under Device Settings >> Recording >> Option. And there is another option there for post-record: 15s, 30s, 1min. For RLC-420 or other cameras with no microSD card, it will also have pre-record if you manually record to PC or FTP upload to server. But the pre-record is significantly shorter. And you have the post-record option if you check client local settings >> Record Settings, which is for local recording to your PC hard drive. From my RLC-410S, I don’t see this option “Device Settings >> Recording >> Option” to set Pre-Record. Please turn off push notifications when I pan/tilt/zoom the camera. It makes no sense to send a motion notification caused by PTZ. hello, do we have any updates to this? it’s been a long while and i still only see “Alarms From IP Camera” on my notification and NOT the specific cam which the alarm was triggered from. it has been another 4 months since i last inquired about the status of “push notification improvement suggestions” thread. i still don’t see any difference in my notification as it still shows generic “IP Camera” instead of unique names we’ve given to each camera unit. 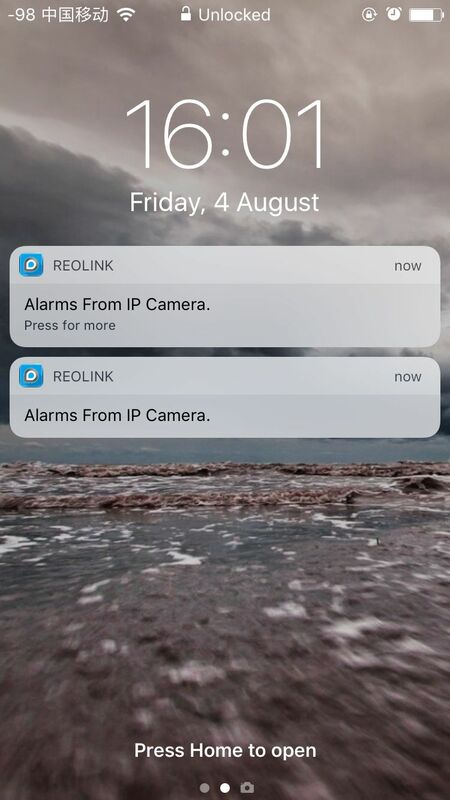 seemed like both my Reolink app and cameras are current version. thank you for the push notification update; now we see the specific camera names instead of generic “IP Camera”. this was a big help giving us a good preview of which camera triggered by motion or otherwise.